Almighty God, as I cross the threshold of this week I commit myself, soul, body, affairs, friends, to Your care. Watch over, keep, guide, direct, sanctify, bless me. Incline my heart to Your ways. Mold me completely into the image of Jesus, as a potter forms clay. May my lips be a well-tuned harp to sound Your praise. Let those around see me living by Your Spirit, trampling the world underfoot, unconformed to lying vanities, transformed by a renewed mind, clothed in the entire armor of God, shining as a never-dimmed light, showing holiness in all my doings. Let no evil soil my thoughts, words, and hands. Have mercy on me, Oh Lord, for I am a humble and miserable sinner. [At this point, pause to remember specific sins you have committed during the past week and speak or think them.] I renounce all of these sins, heavenly Father, and repent of them, and I promise to make every effort not to repeat them. Walk with me, dear Lord, so that I may not be alone as I face this coming week, but always in your presence. Your joy is a lighthouse in a world often dark with sin, and I pray that I may inspire others as I have been inspired. In the name of Christ, bless me this day, and all through the week to come; and bless all whom I may meet. Notice that the people endorsed here are peace makers, not peace lovers. Certainly we must love peace, but that is not the subject of the verse. Making peace denotes an activity, not a passive state. The children of God are what theologians call the “Church Militant,” those who are willing to go forth and, if you will excuse the expression, fight for peace. The first place we must make peace is within ourselves. 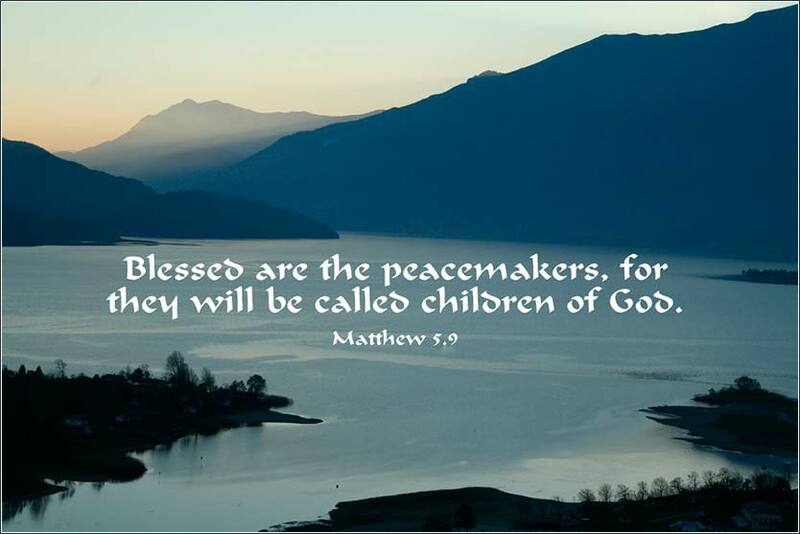 In interpreting Matthew 5:9, the early Christian writers very much emphasized the battle for internal peace. Most people are a walking civil war, subject to an unending struggle between good and evil, pulled in two directions by the Holy Spirit and sinful instincts. Does this ring a bell? Popular cartoonists will depict a person in temptation with an angel on one shoulder and a red devil on the other, one per ear. We can make inner peace only one way: by giving our hearts entirely to Christ. And again, doing so is an active state, for we do not get a diploma that certifies us “Christian” and declare a cease fire. There will be no treaty made with evil; it will try to engage us in battle every minute of our lives. Later commentators have begun to emphasize the need for us to examine our relationships with other people, when discussing this passage. First, how well are we able to let the Spirit control our own one-on-one relationships and our behavior in groups? And secondly, how well have we learned to defuse tense situations between others? For every group, including church groups, will include people who are apt to stir up trouble. “The beginning of strife,” says Solomon, “is like the letting out of water. ” (Proverbs 17:14) So, it is our goal to learn to plug the leak in a dam before it widens. To be peacemakers. Some people have a knack for this — perhaps it might even be called a spiritual gift — but it is a skill that we can all develop, and that is certainly what this verse teaches us to do. The beginning of Nunc Dimittis (“Lord, now you let your servant go in peace”) from a 1412 Book of Hours (Les Très Riches Heures du duc de Berry), a sort of prayer book.